Sandusky's longest lived brewing establishment appears to have begun operations as the City Brewery in 1852. Located on the east side of the north end of King Street (although in later years the plant had the address of 2207 W. Madison St.), the brewery was situated along the Cleveland, Cincinnati, Chicago, & St. Louis Railroad (also known as the Big Four RR. ), just south of the Lake Erie shoreline. Phillip Dauch and Andrew Fischer were the original proprietors, although Dauch operated it alone after Fischer died in 1853. Dauch was a German immigrant who had landed in New York in 1847, and came to Sandusky by way of Cincinnati and Springfield, Ohio. By 1862, he had encountered financial troubles and retired to a nearby farm, selling the brewery to John Bright, Lawrence Cable, & James Alder. They operated the plant until June 1868, when it was sold for $10,000 to George Windisch and Vincenz (Winsen) Fox, who had previously operated the nearby Ilg brewery. Fox sold an interest in the brewery to Frank Stang and John Homegardner in 1870, and two years later Windisch left the partnership. In 1875, Fox declared bankruptcy, and the plant was sold at public auction to Stang and John Bender, a 55-year-old native of Baden, Germany. Bender began expanding the brewery's annual output, doubling it from 3,000 to 6,000 barrels by 1878, the year in which he died. After this it remained in the name of his wife Magdalena ("Lena") Bender for two more years. At that time, she sold the plant to Stang, who had been running the brewery after Bender's death, for $30,000. Frank Stang had been born in Monroeville, Ohio in 1851, and entered into the brewing industry after moving to Sandusky with his younger brother John. John was the traveling agent for the brewery, spending much of his time on the road until Frank withdrew from the company in 1890, after which John became the new president. 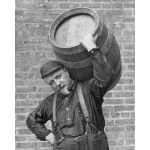 Stang continued to increase the plant's output, and by the late 1880s, the plant employed twenty men or more, including brewmaster Fred J. Beier, in producing between 15,000 and 20,000 barrels of beer annually. Seven teams of horses would deliver the beer in wagons throughout the city, with a great deal of additional brew being sent to surrounding counties. The stone brewery building was three stories in height, 225 by 250 feet in size, with a large attached ice house, capable of holding 10,000 tons of ice, which was cut from a nearby ice pond. A disastrous fire in July 1891 destroyed virtually everything at the plant, including the office, malt house, ice house, ice machine, and most of the stored beer on hand, with a loss of over $100,000. Thought to be caused by a spark from the engine of a passing train, this exemplified one of the primary dangers of operating a brewery near a railroad, despite the obvious transportation advantage (a spark from another train five years later caused the destruction of another, newly built ice house at the site). While the nearby Kuebeler brewery agreed to temporarily fill all of Stang's orders, the plant was completely rebuilt from the ground up over the next year. The pipeline supplying water from the Crystal Rock spring was five miles in length, and was also used by the Crystal Rock Water Company, which sold water in the city of Sandusky. Soon after the turn of the century, however, the water was found to be less uniform in quality than desired, especially when pumped from greater depths. After 1904, the spring water was no longer used for brewing beer, and in fact was replaced by water from nearby Sandusky Bay. The pipeline was taken up a few years later, although the Crystal Rock name continued to be well known in the area for many years, due in part to the continuation by the brewery of using the name for its flagship beer. On March 8, 1896, the Stang Brewing Co. merged with the Kuebeler Brewing and Malting Co. one mile away, forming the Kuebeler-Stang Brewing & Malting Co. Stang became the vice-president of this combine (Jacob Kuebeler was president), which had $700,000 in capital stock, and a collective annual capacity of 350,000 barrels. This entity lasted for less than two years before becoming a part of the Cleveland & Sandusky Brewing Co. conglomerate (which would eventually consist of eleven breweries in three cities) on January 1, 1898. Stang continued to manage the plant, and eventually became vice-president of the parent company after Kuebeler's death in 1904. The plant continued to operate very successfully as a division of Cleveland & Sandusky until 1919 (It should be noted that the two Sandusky plants continued to use the name Kuebeler-Stang for a number of years in their advertising, even after the formation of the Cleveland & Sandusky Co.) See the section on Cuyahoga County for the operation of the parent company. Upon the enactment of statewide Prohibition in 1919, the Kuebeler plant was closed, leaving the Stang plant as the city's only surviving brewery. It continued to operate throughout the next fourteen years, capitalizing on the name recognition of its flagship product by renaming itself as the Crystal Rock Products Co. (still a subsidiary of the Cleveland & Sandusky Co.) Crystal Rock Cereal Beverage, Deerfield Ginger Ale, and other soft drinks were produced through the end of Prohibition with a moderate degree of success. Stang had left the company by 1923 to manage a local wine company, after which the plant was managed by Roy Homegardner, who had been with the company since 1902. With the repeal of Prohibition, the old Stang plant was refurbished as one of only two surviving branches of the Cleveland-Sandusky Brewing Co. (the other being the Fishel plant in Cleveland). In July 1933 it became the first of the two breweries to release beer to the public, when Gold Bond Beer was shipped east for sale in the Cleveland market, followed soon by Crystal Rock Beer, and three new brands, Old Timers and Buccaneer Ales and New York Special Beer. Brewing operations continued successfully for two years until all of the plant's eighty workers went on strike in April 1935, in connection with a massive brewery worker strike in Cleveland (see the section on Cuyahoga County for more on the strike). The conflict was the culmination of a long standing battle for jurisdiction over brewery truck drivers, who had previously been members of the brewery workers� union, but who had recently switched allegiance to the teamsters� union. While the brewery owners were essentially neutral in this conflict, they ultimately paid the greatest price, as the breweries operated at a reduced capacity with replacement workers for several months. The old Stang plant was particularly hard-hit, as clashes between strikers and replacement workers turned violent, with several people being injured in early May when a tear gas bomb was thrown. Rocks and stones thrown at the brewery broke windows and lights, and the plant shut down completely for two weeks. By the end of that month, manager Roy Homegardner announced that the plant would close permanently and the equipment would immediately be dismantled and moved to the main Cleveland plant (the only one remaining in the company). By the time the strike finally ended in November, Sandusky's brewing history had come to a sad end. The brewery stood empty for two years until the buildings and remaining equipment were purchased by local businessman Elliott M. Bender for $100,000. His plan was to sell $300,000 worth of stock in order to make the brewery operable again by the following summer. This plan never took shape, however, and as late as 1938, it was announced that the Sandusky Chamber of Commerce was still looking for a way to get the brewery back in operation. Instead, the plant remained empty for nearly a decade before the entire complex was razed in 1947, leaving no remains today. The Crystal Rock, Old Timers, and Gold Bond brands continued to be produced in Cleveland until the main plant closed in 1962, after which they were produced by the International Breweries Co. in Findlay, OH. and Buffalo, NY. until 1966. The brands were then produced by both the Meister-Brau/Buckeye Brewing Co. in Toledo and the Cumberland Brewing Co. in Cumberland, MD., each of which had rights to the Cleveland-Sandusky name, until approximately 1969. Following a gap of thirty years, the Crystal Rock name resurfaced in 1999 as a brand of Dopple Bock Lager Beer, brewed by the Frontwaters microbrewery in nearby Marblehead (see the section on Ottawa County). The name also lives on at the Crystal Rock campground, near the old spring several miles southwest of Sandusky, which uses the familiar logo to this day.